The Boalsburg Farmers Market moves out to the grounds of the Boalsburg Military Museum today from 2:00-6:00 p.m. With plenty of free parking in a pretty convenient location, this market offers a great variety of local food. Today they will have rhubarb, asparagus, spinach, kale, spring mix, spicy greens, hot house tomatoes, radishes, meals to go, local wines and more. There will also be cooking demo with local cooking instructor and Local Food Journey contributor LaCreta Holland of Happy Valley Learn to Cook, who will demonstrate simple and creative ways to prepare nutritious, local vegetables and fruits. Recipes, nutrition information, and free samples will be included. Be sure to stop by from 3:00 p.m. to 4:00 p.m. for this special event. Other cooking demos will happen at the market on June 14, July 12, and August 9. Local Foods week is July 31-August 6, and part of the celebration will be the Golden Basket Chef Competition on August 2. 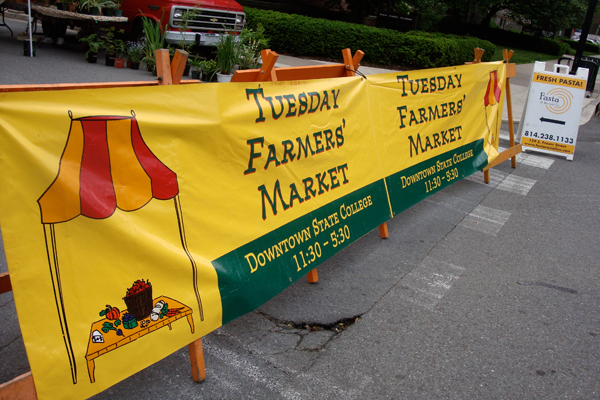 Meanwhile, the Tuesday Downtown State College Farmers Market is kicking things off on Locust Lane in State College. Among the items being sold are spring vegetables, fresh dairy products, garden plants, and tasty prepared items made with local ingredients. Hours for the Downtown State College market are 11:30 a.m. to 5:30 p.m.